108 (+3 basement floors), 110 floors including mechanical. Willis Tower is a skyscraper in Chicago, Illinois. Sears, Roebuck and Company paid for it to be built in August 1970. The building was finished in 1973. It was the tallest building in the world from 1973 to 1996. It has 110 levels. From the ground to the roof it is 442 meters (1,450 feet) tall. It was designed by Fazlur Khan and Bruce Graham. Willis Tower is the second-tallest building in the United States. It is the eighth-tallest freestanding structure in the world. It is the second tallest skyscraper in the Americas. It is one of the most popular tourist destinations in Chicago. More than one million people visit its observation deck every year. 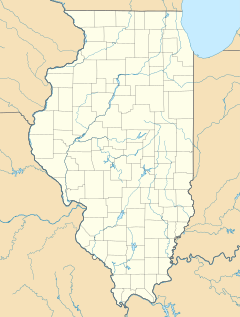 Until July 16, 2009, the building was called Sears Tower. It was renamed after the Willis Group bought it. In 1969, Sears, Roebuck & Company was the largest retailer in the world. It had thousands of workers in offices in the Chicago area. Sears managers decided to put all of those workers into one building. They wanted 3,000,000 square feet (280,000 square meters) of space. Sears hired architects Skidmore, Owings & Merrill (SOM) to design one of the largest office buildings in the world. Architect Bruce Graham and structural engineer Fazlur Khan designed the building. Sears and the City of Chicago approved the design. Steel was transported from South Chicago. The first steel was put in place in April 1971. The tower was completed in May 1973. It cost about US$150 million to build. That is equivalent to $800 million in 2014. The building was built with a fire sprinkler system, even though it wasn't required at the time. There are about 40,000 sprinkler heads in the building. The sprinkler system cost $4 million. Before Willis Tower was completed, the tallest building in the world was the World Trade Center. In 1996, the Petronas Twin Towers in Kuala Lumpur, Malaysia became the world's tallest buildings. The building was renamed Willis Tower in July 2009 after the Willis Group bought the skyscraper. Time magazine called the name change one of the top 10 worst corporate name changes. An online petition was created to change their decision. The naming rights issue continued into 2013. It began when a news reporter of the Chicago Tribune said in 2013 that "We're stubborn about such things. This month marked four years since the former Sears Tower was re-christened Willis Tower, and the new name has yet to stick." Skidmore architects designed Willis Tower to have large floors of 55,000 square feet (5,100 square meters) in the lower part of the building. They got the idea for the design from an advertisement for a package of cigarettes. From the ground to the top of the taller antenna, Willis Tower is 1,729 feet (527 meters) tall. It leans about 4 inches (10 centimeters) towards the west because of the unequal loads on its foundation. Willis Tower is the third tallest skyscraper in North America. The observatory elevators in the tower are the fastest in the world at 1,600 feet (490 meters) per minute. With clear weather, four states can be seen from the observation deck: Michigan, Indiana, Illinois, and Wisconsin. On November 8, 2013, architects in Chicago and New York City started talking about the height of the One World Trade Center. They were saying that Willis Tower might be taller. On November 12, it was confirmed that One World Trade Center is taller than the Willis Tower. Willis Tower has an observation deck. It is called the Skydeck. It opened on June 22, 1974. It is on the 103rd floor of the building. It is 1,353 feet (412 meters) high. It is one of the most famous tourist attractions in Chicago. The observation deck is the highest public viewing area in the United States. Tourists on the Skydeck can feel the building moving on windy days. They can see the plains of Illinois and across Lake Michigan. Elevators take tourists to the top in about 60 seconds. People on the elevator can feel air pressure changes during the ride. In January 2009, Willis Tower's owners began making major changes to the Skydeck. They added retractable glass balconies. The balconies extend about 4 feet (1.2 meters) from the tower. They allow visitors to look through the floor to the street below. The boxes can hold up to 5 short tons (4.5 metric tons) of weight. They were opened to the public on July 2, 2009. ↑ de la Merced, Michael J. (March 16, 2014). "Blackstone Group Purchases Landmark Willis Tower in Chicago". The New York Times. Retrieved August 11, 2015. ↑ 2.0 2.1 2.2 2.3 2.4 2.5 2.6 "Willis Tower – The Skyscraper Center". Council on Tall Buildings and Urban Habitat. June 13, 2015. Retrieved June 13, 2015. ↑ 4.0 4.1 Suddath, Claire (February 8, 2010). "Top 10 Worst Corporate Name Changes: It's the Sears Tower". TIME. Retrieved February 8, 2010. ↑ "Databank: Sears Tower", Wonders of the World, PBS Databank. Retrieved November 19, 2007. ↑ "Willis Tower history and facts". Willis Tower.com. Retrieved December 29, 2013. ↑ 14.0 14.1 "Willis Tower Fast Facts". CNN.com. November 14, 2013. Retrieved December 8, 2013. ↑ 15.0 15.1 "Willis Tower, One World Trade Center compete for bragging rights as America's tallest skyscraper". CBS News.com. Retrieved November 9, 2013. ↑ "One World Trade Center taller than Willis Tower". Examiner.com. Retrieved November 12, 2013. ↑ "Skydeck Chicago - Fun Facts". The Skydeck.com. Retrieved February 16, 2015. ↑ 18.0 18.1 18.2 ""Sears Tower unveils 103rd floor glass balconies"". USA Today. Jul 1, 2009. Retrieved December 29, 2013. 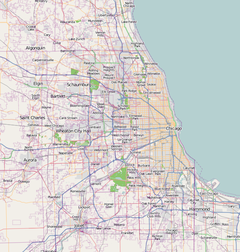 Wikimedia Commons has media related to Willis Tower. This page was last changed on 13 April 2019, at 11:02.